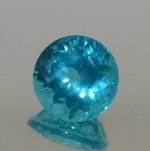 Apatite, "paraiba" blue color, rare large round, 10 mm, 4.50 ct.
Immaculate color, like the finest copper-bearing tourmalines. A few lilly-pad inclusions, typical of this material. SI to VSI, but overall pretty clean. Large for a round in this color. Please note: Much effort has been made in the attempt to get as accurate a picture as possible of our gemstones. Please keep the following in mind while shopping: Cameras do not see color exactly the same as the human eye and lighting conditions often cause large variances. When taking pictures for the web, we have found that it is very difficult to capture the brilliance that the human eye sees and photos cannot often show all of the stones' ambiance and jewelry pieces' fine detail. Also computer monitors vary and often color tones are set to suit the viewer's preferences. When shopping, remember that "the pictures are meant as a rough guide only." All our products have a money-back guarantee (see terms above) so there is no risk in ordering from the Buena Vista Gem Works. To order or check the availability of a gemstone, simply drop us an email or call us. For information on our acceptable payment methods, guarantee, shipping costs, and shipment preference see our Terms and Conditions page.